Due to popular suggestion, I’m switching Farm Work Day to Sundays, 9am-11am. Swing by if you can. Bring gloves and water bottles if you’ve got ’em. See you this Sunday, May 26. The farm is at 663 28th street, at MLK in Oakland. Also, a quick teaser: I’m going to have my first Farmstand on June 7. More on that later, but I’m dovetailing with Oakland First Friday art night. The stand will probably open at 6pm and go til 8pm. I’ll have zucchini, beets, carrots, herbs, rhubarb, greens, honey, t-shirts, and books for sale. It’s full-on harvest season! 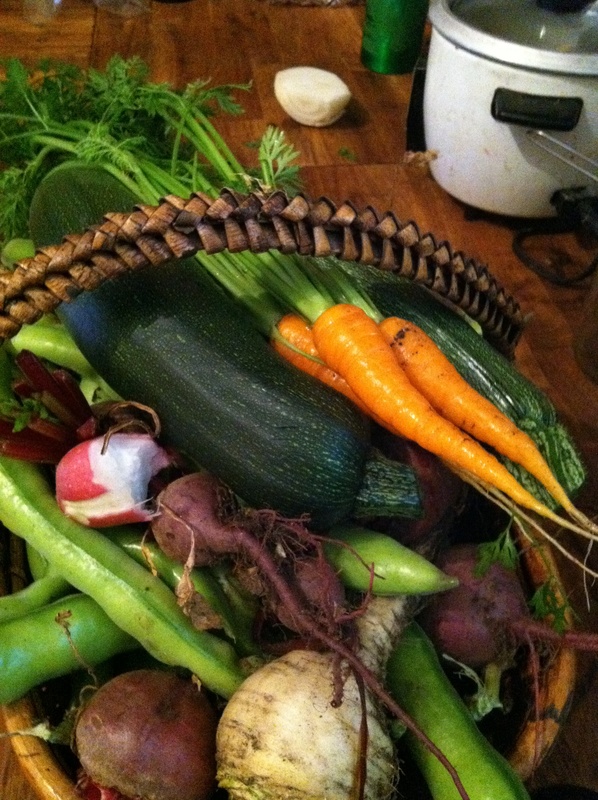 Here’s a little basket I gathered yesterday: zukes, carrots, turnips, the last radish (notice bite taken out of it), fava beans and beets. Franster (and her dolly) helped me harvest some new potatoes, too. I grew these in a metal garbage can with holes tapped into the bottom. 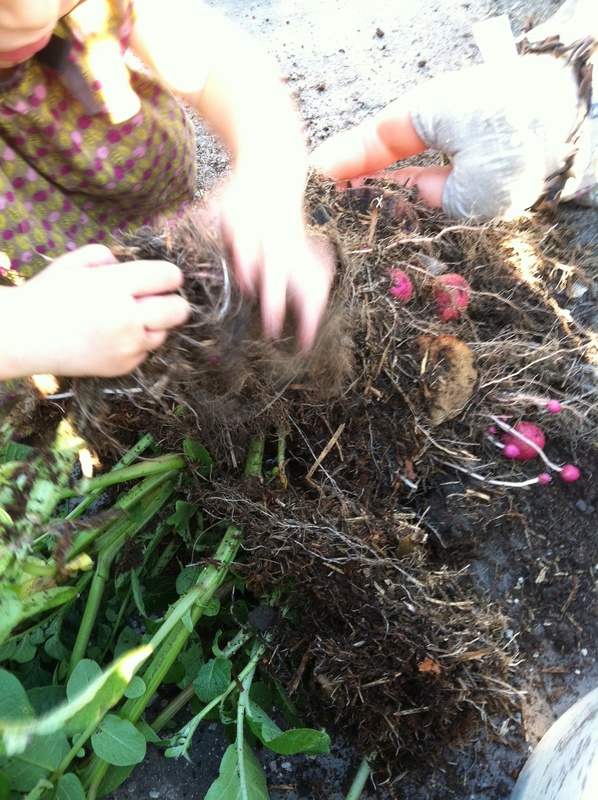 It was a bit of an experiment to troubleshoot a problem I have with volunteer potatoes in the garden. I somehow never get them all out of the ground and then I get potatoes where I didn’t want potatoes anymore. The idea was to keep them contained by planting them into a garbage can. After three months, I only got a few bright red potatoes. The problem was that the can required so damn much soil. I had to really scrounge to find enough to cover up the potatoes as they grew. And I harvested too early (the plant was just flowering). But I needed that garbage can soil for another potato tower I’m growing, this one made out of a smith and hawken stacking composter. Will post results of that experiment. Hi! I won’t be in the garden next week, May 16! See you the following week. I’m also thinking of having another day–let’s take a vote over the next week: which day/time works for you? Let me know in the comments. Yup workday today, 3-5pm at 663 28th street. It will be a lettuce pulling massacre, and greens harvest day. Might fire up the outdoor stove and make kale chips. Aren’t they gorgeous little things? 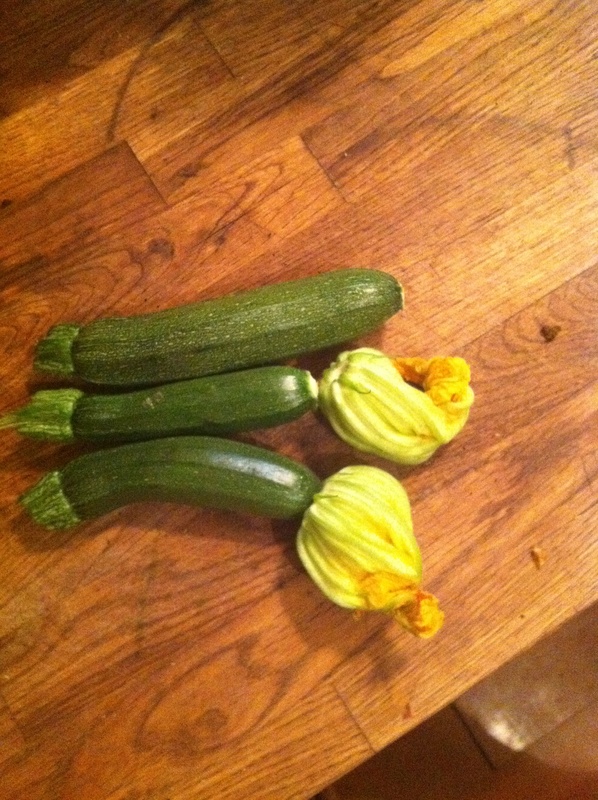 I actually don’t love eating zucchini, but of course I planted two bushes, forgetting what prolific little buggers they are. Summer squash always remind me of those warm, light-filled days, when the living is easy, and you can just go out to the garden to harvest whatever you need for dinner. Love that. My sister was here and made an amazing chard fresh pasta and put the first of the zukes plus their flowers over the pasta. Yum. So, workday is on for today, May 2. 3-5pm, 663 28th street, oakland. It’s going to be very hot, so bring water. I think we will be transplanting strawberries and weeding. See ya! Payment will be in greens, salad mix, and my eternal gratitude.